In cooperation with Primavera // If you read my blog regularly you’ll know that I love to travel and discover new worlds! However, being on the road isn’t always just fun and relaxation – it can be exhausting, especially when I’m travelling on business. And if I’m really unlucky, my body reacts with a sore throat, a headache, an upset stomach or I can’t go to sleep at night because I am so tense and stressed out. So I assembled a small emergency kit of three essential oils to help me treat those symptoms. 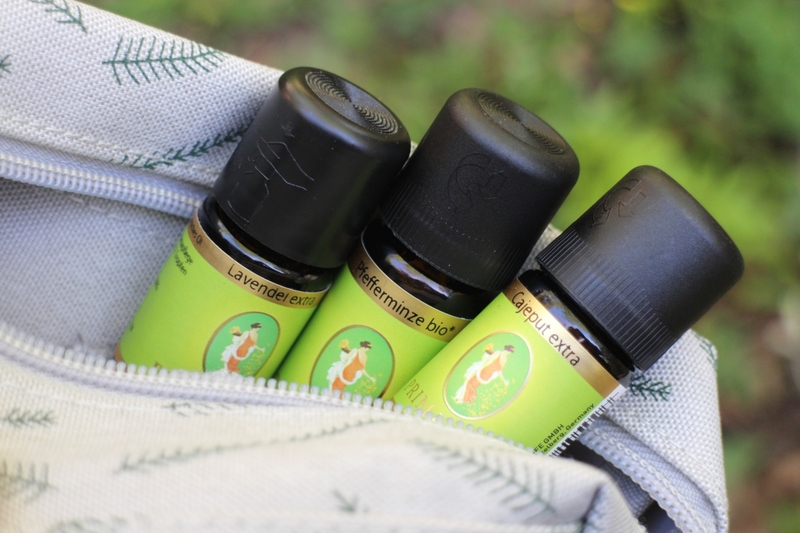 Luckily essential oil bottles are so small that they are easy to carry, even if you’re travelling with hand luggage only! But first some words of caution: You should never use essential oils that you are allergic to. And make sure to always dilute essential oils. Primavera’s essential oils are technically a cosmetic product but because they are of such high quality, it is possible to use some oils undiluted as I’ve outlined below. If you take essential oils internally be very cautious; remember that you only need a few drops and sometimes a single drop is sufficient. If you are pregnant or you want to use essential oils on children, make sure to get a proper consultation before you use the oils, even if they are diluted. Ok, and now let’s begin! Here is my emergency pharmacy with three essential oils that are ideal to relieve travel-related ailments but can, of course, also be used at home when you have a cold, an upset stomach, a headache or small cuts or other injuries. Essential lavender oil is an entire pharmacy in a single bottle. If I had to chose just one oil to take with me to a desert island it’d probably be Lavender Extra from Primavera. The oil is distilled from the wild-harvested blooming panicles of Lavandula angustifolia – this lavender belongs to the labiate plant family; do not confuse it with Lavandin (Lavandula x intermedia) or Speik lavender (Lavandula latifolia). There are many different types of lavender. What’s in it: The Lavender Extra grows at high altitude (800-1200m) in the Provence region of France. The essential oil contains around 300 individual components so it’s very versatile – it’s my favourite type of lavender! Lavender contains a lot of esters (and Lavender Extra has a particularly high percentage of these esters) and monoterpene alcohols which are skin-friendly and have a relaxing effect. How does it work: Lavender Extra essential oil is anti-inflammatory and helps to stimulate the immune system. It also has anti-spasmodic and cell-regenerating effects as well as antiviral, antibacterial and disinfectant properties. The oil has a harmonising effect on the body because it relaxes and soothes the mind but at the same time, it offers a light stimulating effect which is ideal when you feel exhausted. When I’m feeling restless, nervous or tense I put a drop of lavender oil on a handkerchief or a diffuser stone and inhale the fragrance. I also do this when I have trouble going to sleep – luckily this only happens when I’m travelling and I’m too exhausted or excited to sleep. To treat insect bites or smaller skin injuries or burns I apply the lavender essential oil on the affected area of the skin (I use only one drop!). I am always fascinated by how this lavender oil speeds up the healing process and how the itchiness or pain disappears so much more quickly. Lavender oil is also suitable to treat scars, simply blend 2-3 drops with some rosehip oil or sweet almond oil in the palm of your hand. I often get a tension headache when I’m travelling. And I can’t even count the number of times that Primavera’s Aroma Roll-On Clear Head or the essential Peppermint Bio oil has saved the day! 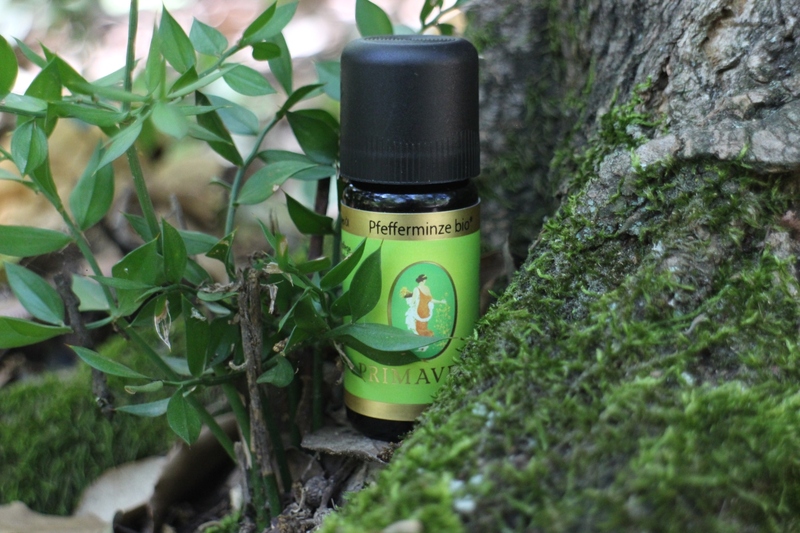 This essential peppermint oil is distilled from the lightly dried leaves of the labiate plant Mentha piperita. What’s in it: The main ingredient in essential peppermint oil is menthol which accounts for over 40% of the oil’s components. Menthol belongs to the group of monoterpenes which are characterised as grounding and soothing. The oil also contains a small percentage of monoterpenoid ketone so you shouldn’t use peppermint essential oil on children under the age of 6. And if you are pregnant or have gall problems or gall stones do not take peppermint essential oil internally. How does it work: The cooling effect is the first thing I associate with peppermint oil. It also has an analgesic (pain-soothing) effect and is anti-inflammatory, antibacterial and antiviral so it’s a great first-aid essential oil for headaches, intestinal cramps or queasiness, or when you have a cold. A double-blind study from the university of Kiel in Germany has found that after 15 minutes peppermint essential oil is just as effective against tension headache as the painkiller paracetamol. Peppermint essential oil also relaxes the gastro-intestinal muscles so it soothes digestive problems, and it refreshes and invigorates the mind which boosts concentration. When I have a tension headache I roll the Aroma Roll-On Clear Head across my neck and then massage the oil blend into the skin. Or I apply one drop of peppermint essential oil to the neck. It takes about 10-15 minutes, then my headache is much better! Peppermint oil also helps me when I feel queasy or my stomach is upset. Simply apply a drop of the oil to a handkerchief and inhale the scent or, for even quicker relief, dissolve a drop of the oil on your tongue (this also aids digestion after a heavy meal). Alternatively you can dissolve a drop of essential oil in a glass of water and drink it in small swallows. When I have trouble concentrating or I’m tired, peppermint helps to invigorate me: I apply a drop to a diffuser stone or to my scarf and inhale the fragrance. Peppermint also works well on insect bites; the oil has a cooling effect which makes the itchiness more bearable. If you have experience with essential oils you can also apply the peppermint oil directly onto the affected area of the skin. Ever since my childhood I’ve had recurring sore throat trouble. This is usually a warning sign sent by my body to tell me that things are becoming too stressful. Unfortunately it also means that I am more prone to catching a cold when I’m travelling or visiting trade shows. 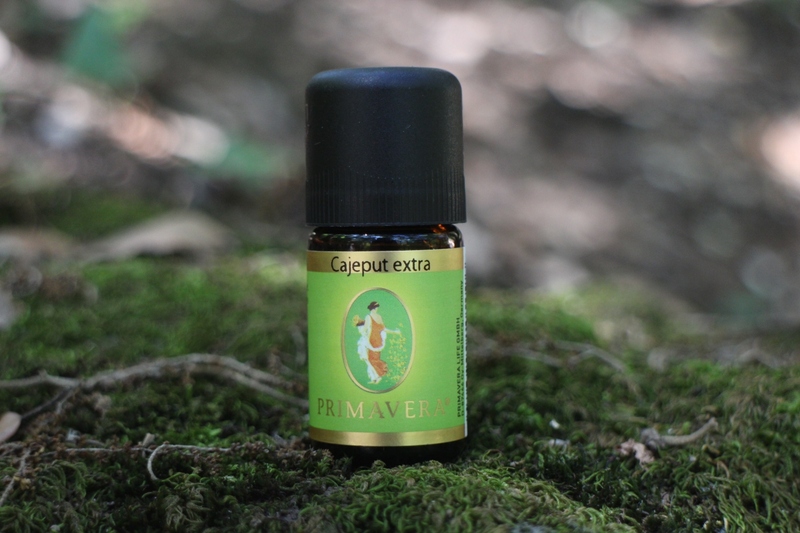 Therefore I always carry the essential oil Cajeput Extra from Primavera in my luggage so I can tackle this kind of respiratory infection as early as possible. Cajeput essential oil is distilled from the leaves and the twig tops of the myrtle plant Melaleuca cajeputi from Cambodia. To my nose the fragrance smells like eucalyptus but a little softer. What’s in it: The two main ingredients are 1,8-Cineol and monoterpenes which means that Cajeput oil is a stimulating but very well tolerated essential oil. How does it work: Cajeput is well-known for its strong antiseptic effect, it also has antibacterial and antiviral properties. The oil is ideal for treating a head cold and it is also recommended for frontal and nasal sinusitis. Cajeput helps to bring down swellings, relieves the urge to cough, has an expectorant effect, can help to decrease fever and strengthens the immune system. Because the oil boosts blood circulation it can also alleviate muscular tension. In addition Cajeput has a stimulating effect on the mind and strengthens the nerves (always a good thing when you have a cold!). Suitable for children aged 6 years and over. If I have a sore throat and need immediate relief I simply add a drop of essential Cajeput oil to a teaspoon full of honey and let the mixture slowly dissolve on my tongue. When I have a cold I put 1-2 drops of Cajeput essential oil on a handkerchief or a diffuser stone and deeply inhale the fragrance – this also helps against the unpleasant stuffy feeling you get with a head cold. 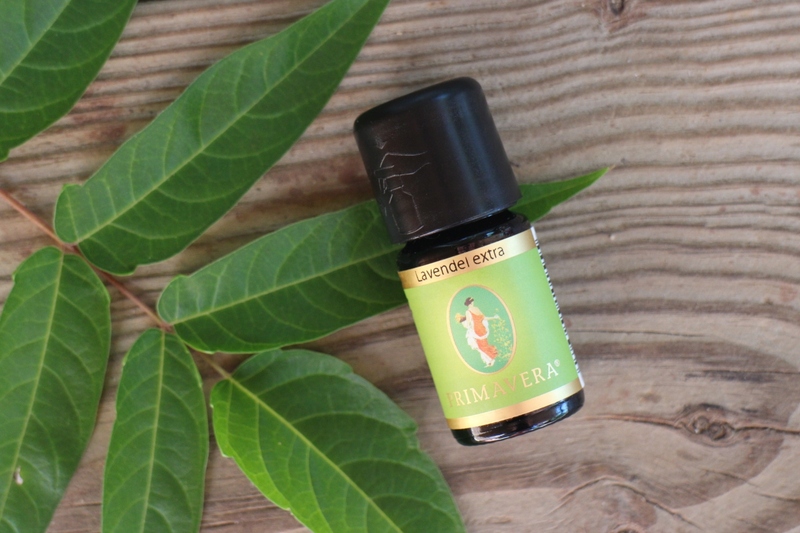 For a classic inhalation I blend 2 drops of the essential oil with 1 litre of hot water. You can also massage a Cajeput oil mixture into the skin on the side of your throat – blend 10 ml jojoba oil with 6 drops of Cajeput Extra oil. Gargling and oil-pulling also helps against a sore throat. I like to blend 4 teaspoons full of sea buckthorn oil with 1-2 drops of Cajeput Extra. Finally a small tip: When I open a new bottle of essential oil I always write the date on the label – essential oils are most effective when they’re fresh and time passes quicker than you’d think. Happy travelling and stay healthy! One of the questions I get asked most often by my readers is „What affordable and effective organic beauty products can you recommend?“. So I decided to compile a list of 10 exciting and unusual products from European brands that retail for less than 10 Euro each and offer the best possible price-performance ratio. The cooperation partner for this post is organic online store Ecco Verde. I spent a long time searching through Ecco Verde’s extensive brand line-up until I found the most interesting Cheap Thrills. I selected the products so they can be used to (almost) assemble an entire skin, hair and body care routine. The list also includes two makeup products and some recommendations for affordable organic beauty brands that you should definitely check out if you’re on a budget. The Argan Anti-Aging Micellar Water from French beauty brand SO’Bio étic is definitely at the very top of my list. I really can’t do without a micellar water in my own cleansing routine any more: I use it as a first step in cleansing to remove most of the makeup. Apply some micellar water to a cotton wool pad and gently stroke it across your eyes, lashes and cheeks. Then I cleanse the entire face with a cleansing milk. Other women use the moisturising effect of micellar waters by using it as a last cleansing step or as a single cleansing product. Theoretically you don’t have to rinse off micellar waters which is why this type of cleanser is very popular in the backstage areas of fashion shows. The Argan Anti-Aging Micellar Water from SO’Bio étic contains camomile water, hyaluronic acid and argan extract and thoroughly cleanses the skin without drying it out (it’s alcohol-free). The bottle contains 500 ml (which will last you for a very long time) and costs 8.99 Euro – I think that’s an unbeatable price-performance ratio. 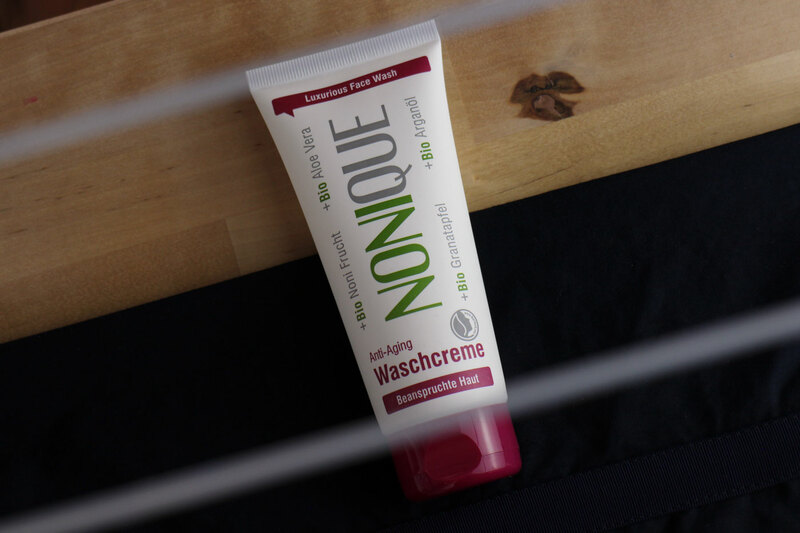 I am always searching for affordable surfactant-free cleansing milks and when I went through the face cleansing section of Ecco Verde’s online store I noticed the Anti-Aging Wash Cream from Nonique. This cleansing cream doesn’t contain any surfactants so it cleanses the skin gently without disturbing the protective acid layer. You apply the berry-scented cleansing cream on moistened skin, massage it into the face and then rinse it off with warm water. I use a soft cleansing cloth which works really well. Because the wash cream isn’t too rich in lipids the skin doesn’t feel greasy afterwards. Nonique is a German brand whose products are formulated with the extract of noni fruit. Vegan. Costs 4.49 Euro and is especially suitable for dry skin which needs a gentle cleansing product. Danish beauty brand Urtekram is always a good recommendation for affordable organic beauty. One of the brand’s product ranges – No Perfume – is fragrance-free. I selected the day cream from this range because I wanted an affordable, basic day cream that can be used every day. And I think the No Perfume Day Cream does the trick! The moisturiser is based on water, glycerin and shea butter with a light texture that is reminiscent of a cream fluid. The day cream is easy to distribute on the skin and is absorbed quickly. I like the balanced combination of hydration and lipids which leaves a very soft protective film on my skin. I would recommend this day cream for normal to dry skin; the product’s probably too rich for oily skin. Or, if you have oilier skin, you could try applying the cream on damp skin. And if you have very dry skin, apply a serum (for more hydration) or a rich cream or balm (for more lipids) on the really dry areas of your face. Because the Day Cream doesn’t contain any fragrance it simply has a natural creamy-waxy scent. And it only costs 7.40 Euro for 50 ml. Italian brand Fitocose offers unusual organic beauty products at a very low price point. I have already shown you the face cream with mandelic acid on the blog – and in Ecco Verde’s store I have now discovered the Eye Cream from Fitocose which is based on water, cornflower water and squalane. The active ingredients include hyaluronic acid, an amino acid and centella asiatica (also known as „tiger grass“, an ingredient which is especially popular in Korean cosmetics – you can find it in most „Cica Creams“). Centella asiatica boosts the skin’s own cell regeneration so it’s often included in products designed to treat scars. The Jalus Eye Cream is a basically a cica cream for the eyes! The texture is creamy and quite rich without being greasy or heavy. The cream has a very light floral scent and is packaged in an airless dispenser. 15 ml cost 9.89 Euro and the skin feels velvety soft afterwards. 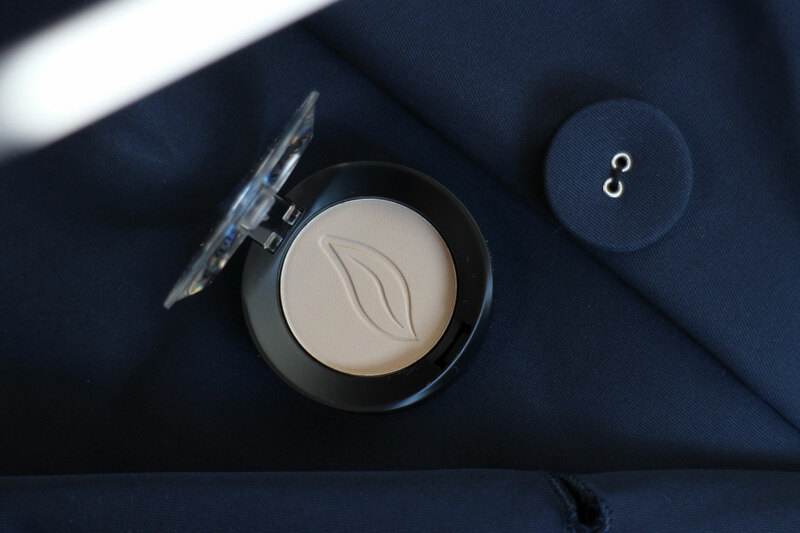 If you have to keep an eye on the budget check out the organic makeup from Italian brand PuroBio. The eyeshadows are of particularly high quality and the choice of colours – there are 23 shades – is much bigger than the colour palette of your average organic makeup brand. I already introduced a autumn-themed golden-purple eyeshadow look in this 2016 post here; this time I wanted to try out the Compact Eye Shadow in 02 Dove Grey from PuroBio – a shade that is suitable for every day (also, I admit it, I love taupe eyeshadows!). #02 is a light taupe; more of a beige-grey with a matte finish so it is ideal for natural looks (think soft, fluffy winter sweaters…) but can also be used as a base for Smokey Eyes or as a neutral blending tone if you’re working with stronger eyeshadow colours. The eyeshadow crumbles a little bit in the pan but not on the lids and it lasts really well. You can buy this eyeshadow as a palette refill for 5.49 Euro or individually for 6.89 Euro. 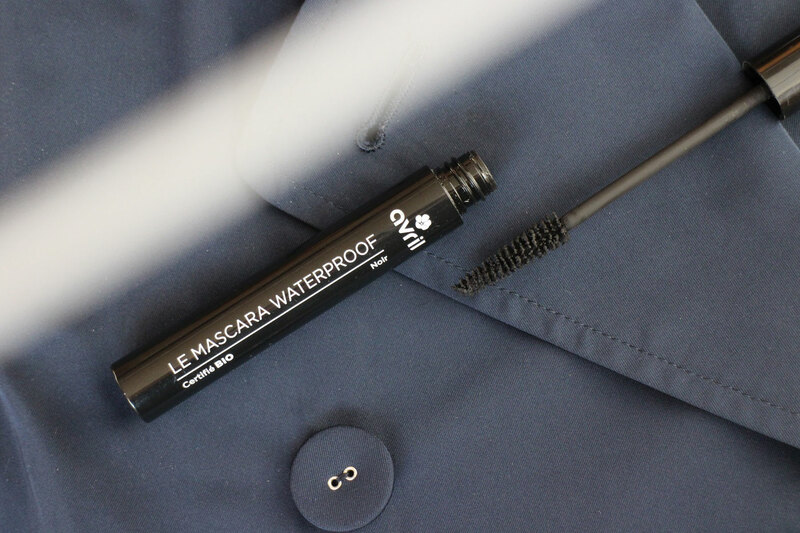 French organic beauty brand Avril has started a small revolution with its recent Mascara Waterproof launch: certified organic and water-resistant – that’s a very rare combination. And even better: this mascara only costs 6.99 Euro! 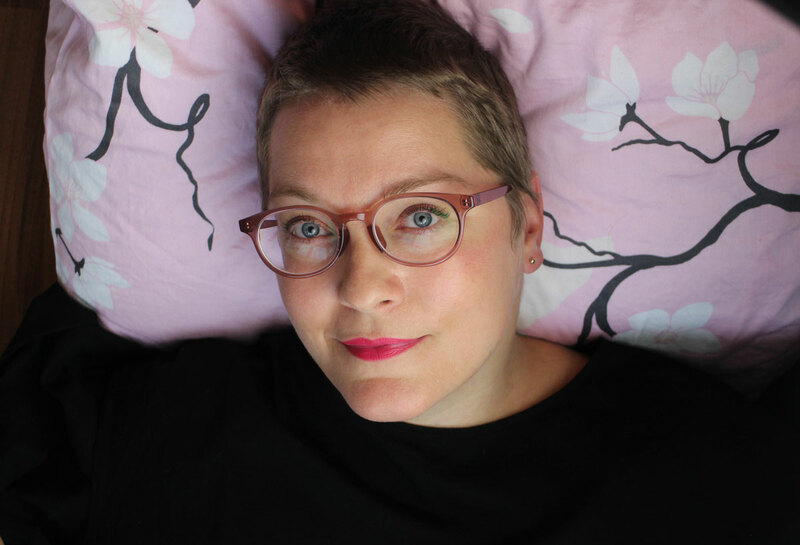 I already tested the mascara thoroughly in this article here. I am satisfied with the water resistance – I used the mascara throughout this summer in swimming pools and in lakes and it performed really well on my eyelashes. The mascara doesn’t offer any volume or lengthening though; it’s more of a classic look. 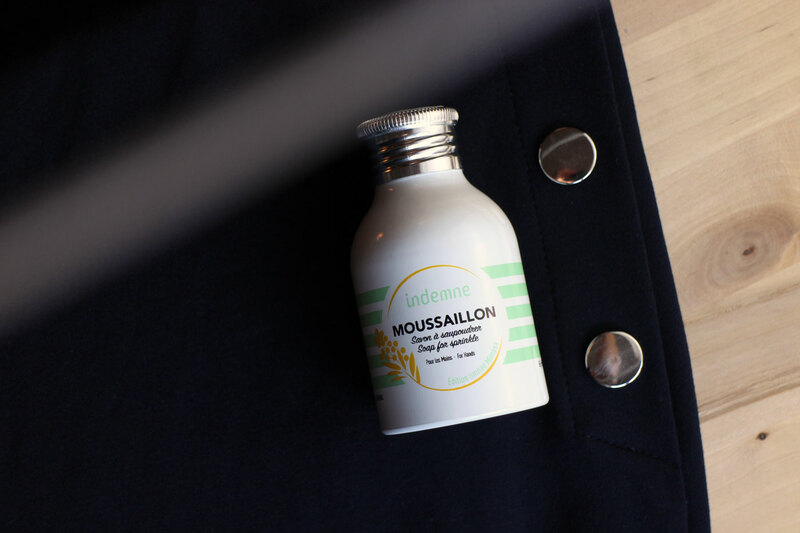 Classic but also unusual is the recent launch from French beauty brand Indemne: this summer the company introduced Moussaillon Mimosa from Indemne, a powdery soap packaged in a shaker. The limited edition has a fresh-floral fragrance – Indemne also has a lemon-scented variant – and it’s easy to use. I shake a little of the finely-milled soap powder into my wet hands, rub the hands together and then rinse them off. The Moussaillon Mimosa is based on saponified olive oil (very traditional, like the classic French Marseille Soap) and also contains moisturising shea butter. You can also use the powder soap to cleanse your body, of course! And the soap shaker looks very elegant in my bathroom 😉 . The bottle contains 50 gr and costs 8.99 Euro. 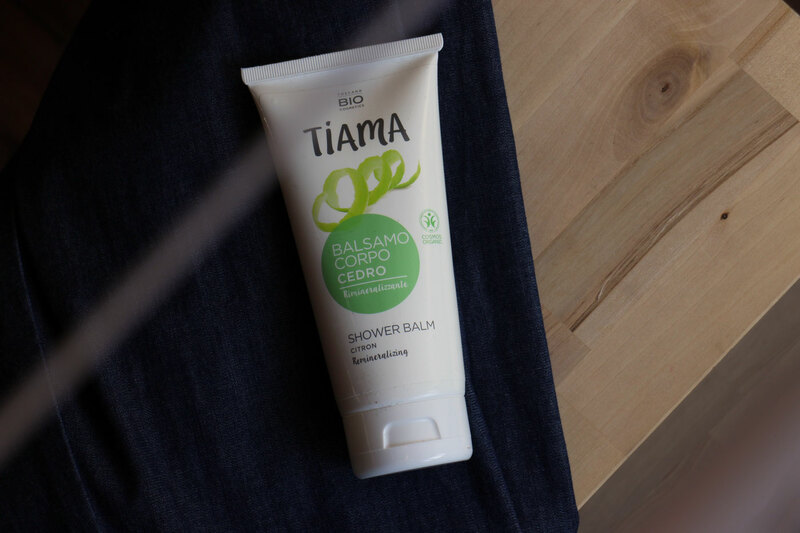 At Vivaness trade show this year Italian brand Tiama presented its new shower balm Cedrat: the balm works like a hair conditioner for the skin. After showering you massage the balm into wet skin, let it work for 2 minutes and then rinse yourself off. Because the balm transports the moisture into the skin it feels silky-soft without leaving a sticky after-feel, so you can dress immediately. The Cedrat shower balm can basically replace your body lotion. The product is based on water, aloe vera and sunflower oil and I love the citric-fresh lemon scent. If you have really dry skin you could even use the Cedrat Shower Balm as a surfactant-free body cleanser. I already wrote about the iris-scented variant of the shower balm last year – check out this article here. The balm costs 5.99 Euro for 200 ml. If you’re looking for an affordable and unusual hair care range check out Austrian beauty brand Hands on Veggies: Their product range is based on fermented vegetable ingredients! I have already published several articles about this novel product concept on Beautyjagd – check out this blog post here. My favourite shampoo, the Repair & Care Shampoo Pumpkin Argan from Hands on Veggies, contains a blend of sugar-based surfactants and wash active amino acids; argan oil and rice proteins condition the hair. 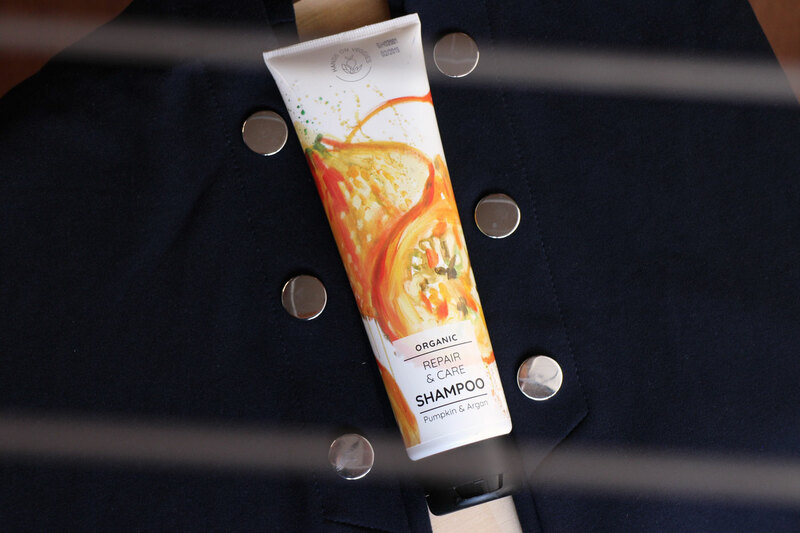 The texture of the shampoo is pretty liquid so it is easy to distribute – I usually wash my hair twice (as I do with most organic shampoos); during the second round the shampoo foams up really well. Because of the proteins my hair feels like it has a bit more texture – although I don’t really need it 😉 . The tube packaging is manufactured from renewable raw materials. Besides the pumpkin-argan shampoo for dry hair Hands on Veggies also offers other shampoos for different hair types, for example for fine or oily hair. The large tube with 150 ml costs 8.99 Euro, a travel-sized 50 ml is available for 3.99 Euro. The products of Russian organic beauty brand Natura Siberica are also affordable. As the brand name indicates this beauty brand focuses on ingredients from Siberia. The Frost Berries Nourishing Hand Mask from Natura Siberica, for example, contains cloudberry and lingonberry as well as Siberian pine oil. The cream is based on water, processed plant oils and various herbal and plant extracts from Siberia; the light fragrance is a blend of fruity and berry notes. The hand mask works like this: You apply a thicker layer of the cream on both hands and leave it on for 5-10 minutes. Use a soft cloth to take off the rest of the cream (or rinse it off); I actually prefer to use a damp cloth. The hands feel soft and moisturised afterwards, without any stickiness! I like the ritual of a hand mask – not just because my hands feel amazing afterwards but also because you can’t really do anything with the thick cream on your hands (can’t touch the smartphone or laptop), so it’s a ten minute break in which you literally let your hands rest. Quite relaxing actually 😉 . And here we have reached the end of my ten budget beauty recommendations. I hope you were able to find some new product inspirations! 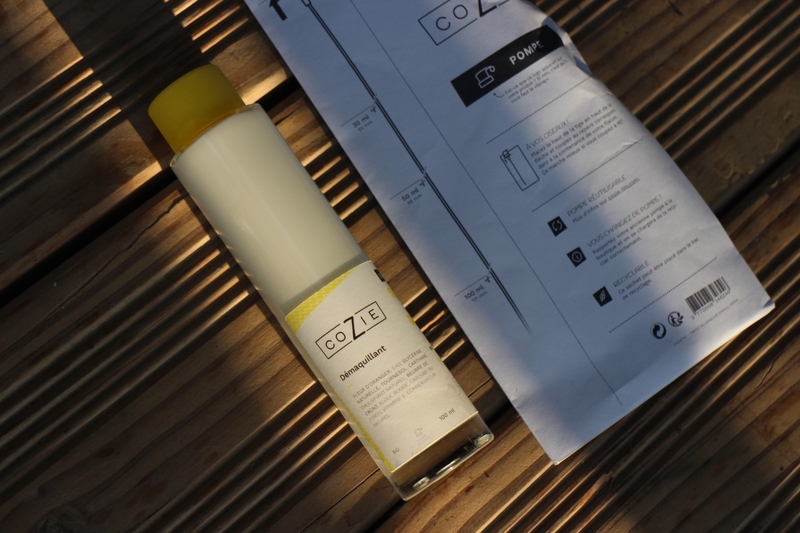 After my Instagram post about French organic beauty brand CoZie generated so much interest I decided that I really had to present this interesting beauty brand on my blog. During my travels in France this summer I saw CoZie several times in various French organic supermarkets – in fact, the bright yellow colour of the lid practically highlights the brand. On the picture above you can see a presentation of CoZie’s product line-up in the organic store „Biocoop La Margoule“ in Nîmes. CoZie’s concept embraces much more than just an attractive packaging design or organic ingredients. All products are packaged in glass bottles which can be returned for a deposit of 1.50 Euro. A deposit system for cosmetics! It works like this: you take a bottle from the shelf and take it to the cashier. At the cash register you receive a matching pump dispenser and pay the price for the product plus an additional 1.50 Euro deposit. This deposit is returned when you bring back the empty bottle to the place you bought it – or, alternatively, you won’t have to pay a deposit on the next bottle you buy. CoZie cleans and reuses the glass bottles and the caps; the pump dispensers will be recycled. In the Biocoop store in Vaison-la-Romaine I finally bought CoZie’s cleansing milk Démaquillant for 14.85 Euro. The cashier handed me the matching pump dispenser in a small envelope. Of course I’ll only receive my deposit of 1.50 Euro if I’m in France, returning the bottle and yellow cap to an organic store. I like the formula of the cleansing milk which is based on orange blossom water and is practically surfactant-free. So far there are seven CoZie products which are intended for both men and women: a lighter and a richer face cream, a cleansing milk, a facial oil, a body lotion, a deodorant and a hand cream. The brand is quite minimalistic which is reflected in the simple design. The ingredients are certified organic by French label Nature & Progrès. The brand name CoZie stands for Cosmétiques Objectif Zéro Impact Environnemental – in translation: cosmetics which have the goal of applying the least possible negative impact on the environment. Part of the brand concept is to produce as little waste as possible (a zero waste approach) and to source its natural, renewable ingredients primarily in France. There are three founders in the young team of CoZie which is based in the North of France near Lille. Emeric Baracat, Arnaud Lancelot and Louise Salvati (an influencer in the zero waste movement) launched the brand in 2017. And they’ve become very successful since then; in France CoZie is already present in more than 300 stores. CoZie has also developed a portable filling machine which I saw on Instagram. The plan is to install this machine in several points of sales so customers can fill their product bottles themselves (or have someone fill it for them; I wasn’t able to find this out precisely). You can also buy the CoZie products online, they are priced from 10.50 Euro to 21 Euro. A shop finder on the CoZie homepage lists all points of sales in France. 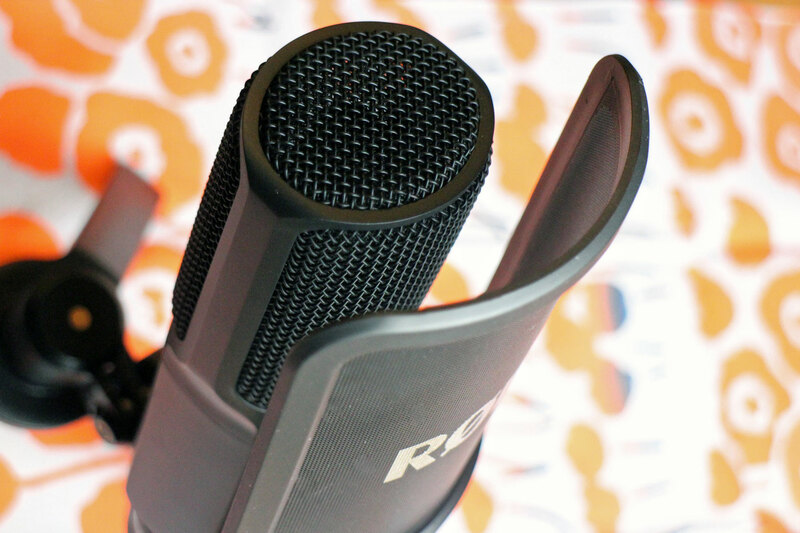 A very exciting and innovative product concept – I’ll definitely keep an eye on this brand. In cooperation with INARI Arctic Beauty // Do you know Lapland? It’s a region in Finland which is located near the Arctic circle. For around two months in midsummer – during the time of the summer solstice – the sun never goes down and the sky is brightly lit all day and night. And in the winter months Lapland is wrapped in almost constant darkness – the only sunshine you get is an indirect illumination which makes the snow-covered Nordic landscape glow with a luminescent light. The landscape of Arctic Circle is so remote and untouched by modern life that its forests and lakes offer the purest and most uncontaminated water and air quality in the world. 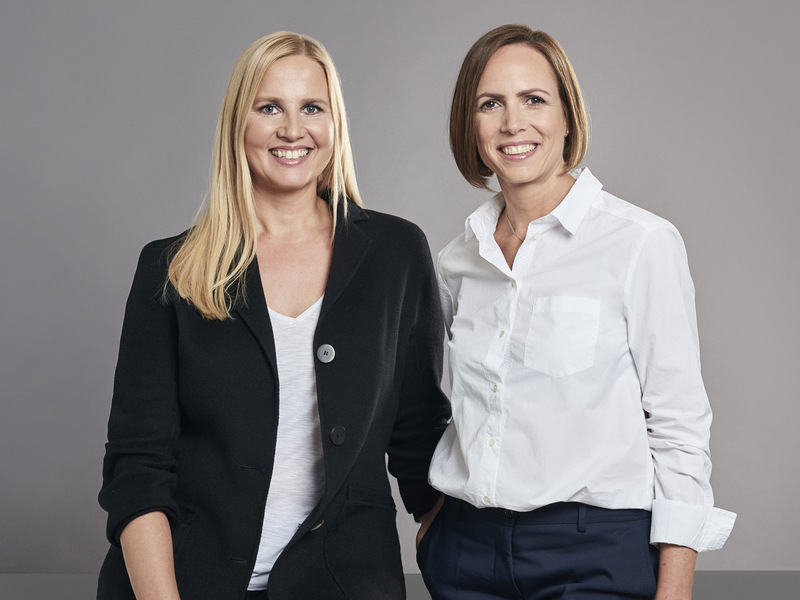 So it’s not surprising that Sirkku Hahn and Nina Stenberg, the two founder of organic luxury beauty brand INARI Arctic Beauty, describe that landscape as their true home. Sirkku and Nina both have Finnish roots; Sirkku actually grew up in Northern Finland near the Polar Circle. If you live in Germany you might know Sirkku as the original founder of organic online beauty store Hilla Naturkosmetik. 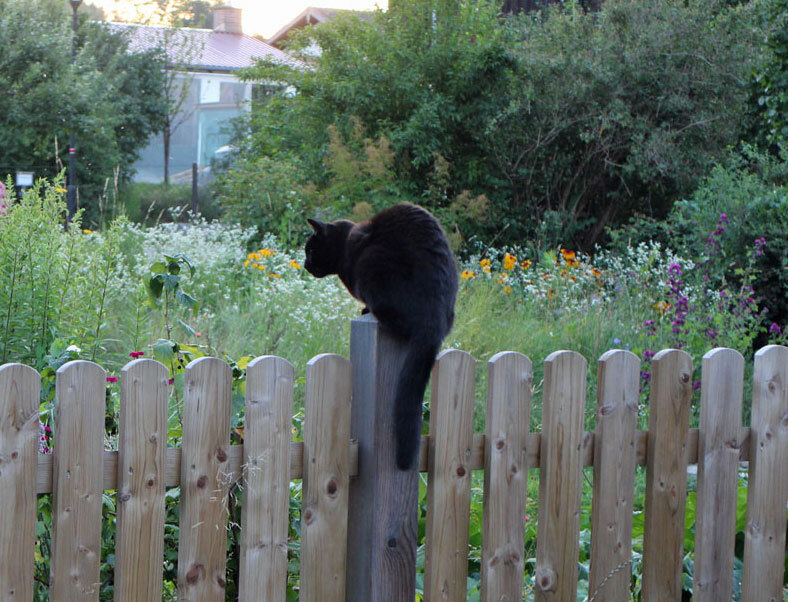 The picture above was taken by Sirkku this summer at around midsummer – during the middle of the night, by the way! – while she was looking at the holy island of Ukonsaari in Lapland. Pure midsummer magic! The exceptional Arctic landscape inspired Sirkku (left on the photo) and Nina (on the right) to develop a luxurious organic beauty range based on the most effective and unique Nordic ingredients. 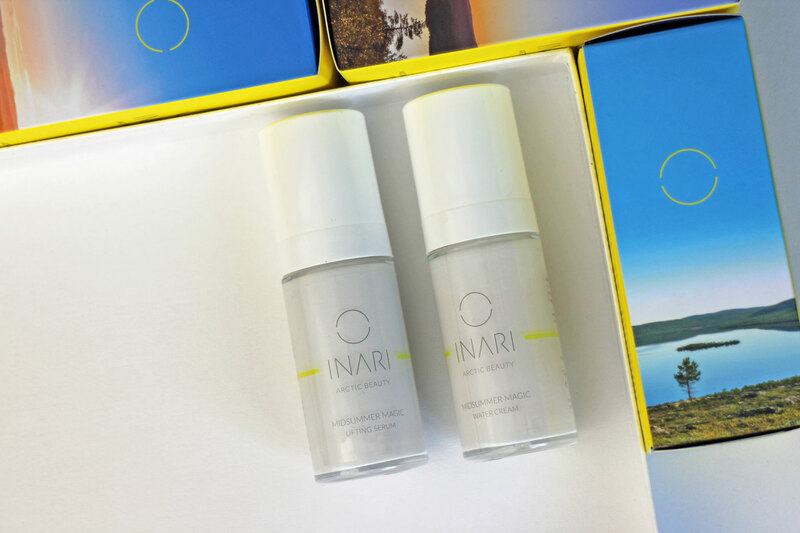 Over the course of twelve months the INARI Arctic Beauty team developed four products which offer uncompromising quality and a proprietary ingredients complex which was especially developed for INARI Arctic Beauty. The active ingredients are all superfood plants from the Arctic region. Because the trees, mosses, lichens and berries that grow in the landscape of the Polar Circle have to survive in an exceptionally difficult climate – permanent snow, icy temperatures and no sunlight in the winter months and constant UV exposure during midsummer – the native Arctic plants contain very high levels of vitamins and minerals. These antioxidants protect the skin against free radicals and have a powerful anti-ageing effect. The luxurious product textures were inspired by classic Korean beauty products and the entire range is produced by a well-known organic beauty manufacturer in Finland. INARI Arctic Beauty’s proprietary ingredients complex is a blend of six native Arctic plants. Because these plants grow in such severe climatic conditions they are a true powerhouse of antioxidants. The complex contains the so-called „Ginseng of the North“ (Rhodiola Rosea), the bark of the White Pine (Pinus sylvestris), chaga mushroom (Inonotus Obliquus), cloudberry (Rubus Chamaemorus) fruit extract, lingonberry seed oil (Vaccinium Vitis Idaea) and the leaf extract of the wild blueberry (Vaccinium Myrtillus). The highly antioxidant formula is blended with ethyl ferulate, a strong derivate of ferulic acid which is an ingredient that is often combined with vitamin C.
The ingredients complex boosts the production of collagen and hyaluronic acid within the skin. Thanks to the antioxidant properties of the Arctic Blend it has a beneficial effect on already existing skin damage caused by UV exposure. Three of the plant ingredients help to block tyronase (a melanin-producing enzyme) and gently brighten skin discolourations. As a tree fan I find the White Pine extract particularly interesting. This ingredient is derived from the tree bark of the White Pine which grows in Finland. Because of the cold and rough climate the bark of the Finnish White Pine contains especially high levels of antioxidants, including oligomeric proanthocyanidins (OPC) which is known for its anti-ageing properties. Studies have also shown that the bark extract has an anti-inflammatory effect on skin diseases such as psoriasis and atopic dermatitis. The wild blueberry leaf extract is not a fruit extract – it’s derived from the leaves of the wild-growing blueberry. Sirkku and Nina chose this ingredient because the effects of its tannins and vitamins against free radicals are much stronger than pure vitamin C or vitamin E. I also like the natural arbutin which helps against redness and hyperpigmentation. The chaga mushroom is currently seeing a bit of a trend in Western Europe. In Russia and China, of course, it has been used as a healing plant for a very long time. The chaga grows on the bark of the birch trees and contains components such as beta-glucane which boosts the skin’s own regenerative powers. Chaga extract also contains calcium, copper, magnesium and potassium – these minerals are vital for skin health and help the skin retain moisture. 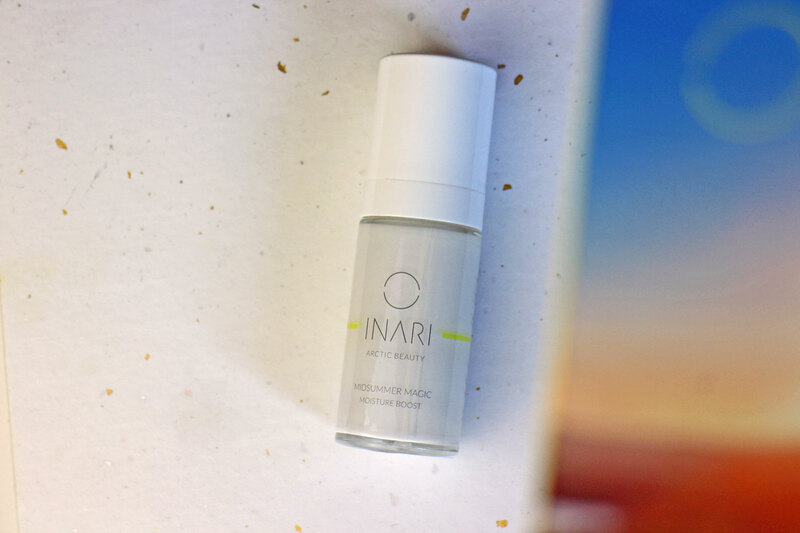 The vegan product formulations are based on pure Finnish spring water – a perfect match for the brand name, actually, because INARI Arctic Beauty refers to the famous Inari lake in Northern Finland! The other ingredients are just as high in quality: the highly concentrated hyaluronic acid is manufactured in Europe and contains three different molecular sizes so it can reach the different layers of the skin. A golden sunrise in Lapland is the image depicted on the cardboard packaging of the Midsummer Magic Moisture Boost from INARI Arctic Beauty, a day cream for normal to dry skin. Based on Finnish spring water, sweet almond oil, plant-based squalane and jojoba oil, the moisturising texture is smooth and easily absorbed into the skin, with a good balance of lipids and hydration. The light beige colour comes from the plant extract and the scent – a natural fragrance blend without any allergenic ingredients – combines fruity and earthy notes. I immediately had to think of the Nordic ingredients: chaga, pine bark, blueberry leaf and cloudberry fruit! My skin (which tends to be on the dry side) feels very well moisturised and silky soft. The Moisture Boost is packaged in an airless flacon which is made from glass and equipped with a pump dispenser. One bottle of the Midsummer Magic Moisture Boost contains 30 ml and costs 119 Euro. In summer time Lapland is bathed in constant sunshine while the winter season is dark and icy cold. The night-time sky is embroidered with stars and the only illumination comes from the white snow on the ground or the spectacular Northern Lights. 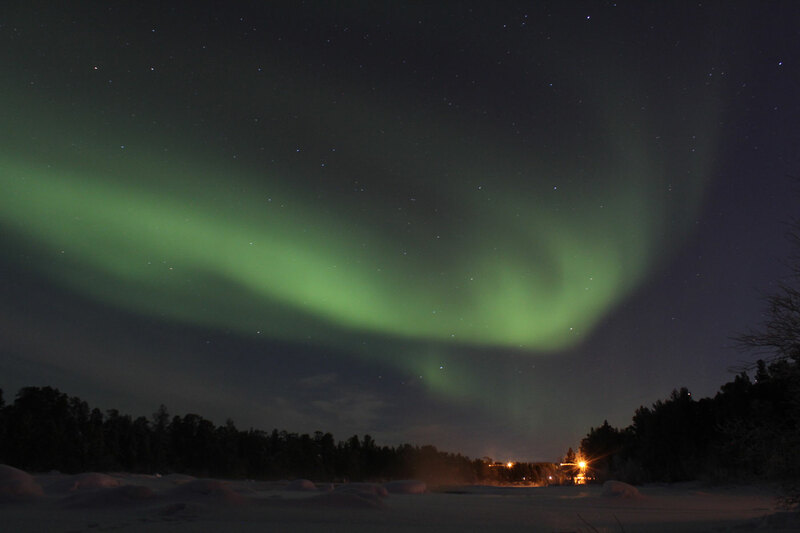 In January 2017 I was fortunate enough to witness the Polar lights near an almost frozen river in Northern Finland – you can see them in the picture above. It was an unforgettable experience. The long nights of the European winter season are an invitation to follow the rhythm of nature – now is the time for rest and relaxation. 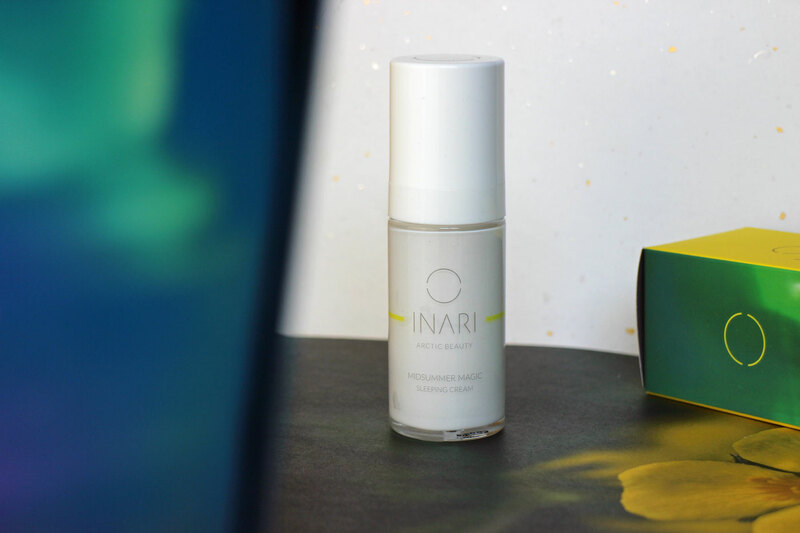 And the Midsummer Magic Sleeping Cream from INARI Arctic Beauty – which is my personal favourite from the product range – helps to regenerate the skin during the hours of the night. It’s a Korean-style sleeping pack which forms a protective non-greasy film on the skin to seal in moisture; like a cocoon which softly shields the skin without weighing it down! Like all products in the range the Sleeping Cream has been formulated with the antioxidant Arctic complex. I like the creamy texture which leaves the skin feeling velvety soft, like a face mask that you wear all night. The Sleeping Cream from INARI Arctic Beauty is packaged in an airless flacon (with pump dispenser), contains 30 ml and costs 119 Euro. I’ve already described my cooling and soothing DIY Serum Mask based on the Midsummer Magic Lifting Serum in these Beauty Notes here (German only, sorry). The serum is a real antioxidant boost, it contains an especially high percentage of plant ingredients which is reflected in the beige product tint. Despite the gel-like texture this serum isn’t watery; I can even wear it as a stand-alone night care product. Even when you apply it without any toner or essence underneath it doesn’t make the skin feel tight – the serum contains jojoba oil and almond oil so it has a smoothing effect. If you layer the serum underneath a cream your skin receives a particularly strong boost of hydration. The Lifting Serum contains spring water, glycerin, zinc PCA and hyaluronic acid and the skin is plumped up a bit so the face looks smoother. One flacon of the Midsummer Magic Lifting Serum from INARI Arctic Beauty contains 30 ml and costs 145 Euro. The Midsummer Magic Water Cream was developed for oily and combination skin; the formulation is almost oil-free so the light texture is absorbed into the skin almost immediately. The focus of this cream is hydration which is exactly what oily skin or greasy combination skin types need. Since my skin is rather dry I applied the Water Cream underneath my sun cream this summer or used it as a makeup base. The ingredients list of the Water Cream begins with spring water, followed by plant-based squalane which is derived from olive oil. I like squalane very much because it’s an important part of the skin’s own protective acid mantle and it leaves a soft, smooth feeling on the skin. I think the Water Cream would also be ideal for menopausal women with oilier skin types that prefer a lighter moisturiser – this cream won’t trap any heat underneath it. A flacon of the Water Cream from INARI Arctic Beauty contains 30 ml and costs 119 Euro. All four products are available in the brand’s own online shop (you can also find the complete INCI lists there). German online perfumery Flaconi and organic online retailer najoba also carry INARI Arctic Beauty. And so do the following stores in Germany: Organic Luxury in Munich, Curantus in Münster, Greenglam in Augsburg and Julie Shines in Cologne. In Helsinki you can buy the INARI products in domestic department store Stockmanns, in organic beauty/concept store Jolie and in the Jolie online shop.